Adults and children with poorly controlled diabetes have a higher risk of tooth problems and gum disease than people without diabetes. Visit your dentist every 6 months for advice about how to keep your teeth and gums healthy. How does a high blood glucose level affect my teeth and gums? 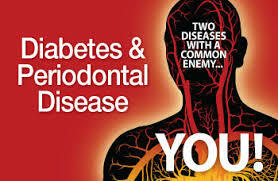 A narrowing of blood vessels can reduce blood supply to the gums therefore increasing the risk of infection. A gathering of sugars in the gingival fluid can increase the risk of developing tooth decay and cavities. Avoid having a dry mouth by drinking plenty of water and chew sugar-free gum to stimulate saliva production. Clean your teeth and gums twice a day How to brush and floss your teeth? If you have full or partial dentures clean them daily and remove them each night before sleep.